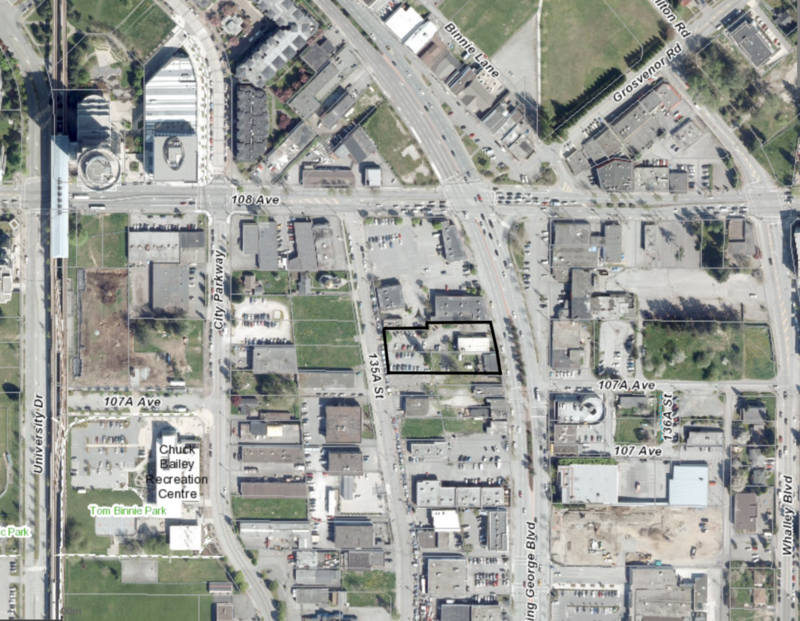 A development application has been submitted for a mixed-use tower at 10731 King George Blvd just south of 108 Avenue. The subject site is made up of 3 existing lots which currently contain a run-down 2-storey commercial/residential building, and a 1-storey medical clinic. The subject application is proposing to consolidate the 3 lots into 1, rezone the site from CHI to CD (based on RM-135 and C-15), as well amend the City Centre Plan to permit a 345-unit mixed-use development. The site is currently designated ‘Mixed-Use (3.5 FAR)’ under the City Centre Plan. In addition to redevelopment of the site, the application would also dedicate a portion of future 107A Avenue just to the South. The 2 adjacent properties to the South are currently owned by the City for the purposes of completing this new road connection. The subject site is located directly across King George Blvd from Tien Sher’s anticipated ‘Whalley District’ development, set to replace the recently closed-down Flamingo Hotel and Bar. Combined, both projects would mark the beginning of renewal and transformation of the area surrounding King George & 108 Avenue, which has become notoriously run-down over the past few decades. This area is designated as a ‘Historic District’ in the City Centre Plan, due to its historical significance as the place of Surrey’s early urban beginnings surrounding the former ‘Whalley’s Corner’ Gas Stop. Posted on March 27, 2019 March 27, 2019 by UrbanSurreyPosted in DevelopmentTagged 108 Ave & King George, Historic District, Whalley District.